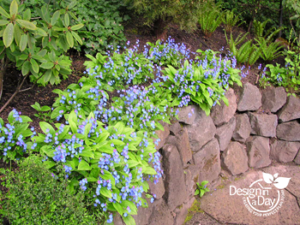 Bright blue Navel Wort – Omphaloides cappadocia ‘Cherry Ingram’ graces this dry stacked boulder wall in NW Portlands’ Willamette Heights. Clients love this plant! 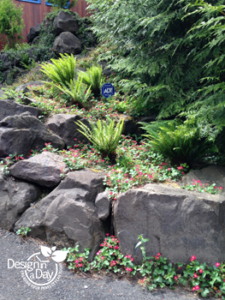 Boulders create opportunity in Portland landscape designs. As a Portland landscape designer I love boulders. They are so versatile and especially helpful with complex small urban properties. New construction properties in the city are always on difficult lots now unless they are a tear down. The lots are either very narrow, an unusual shape or steep. The easy lots were built on years ago. They are a good challenge for experienced designers. 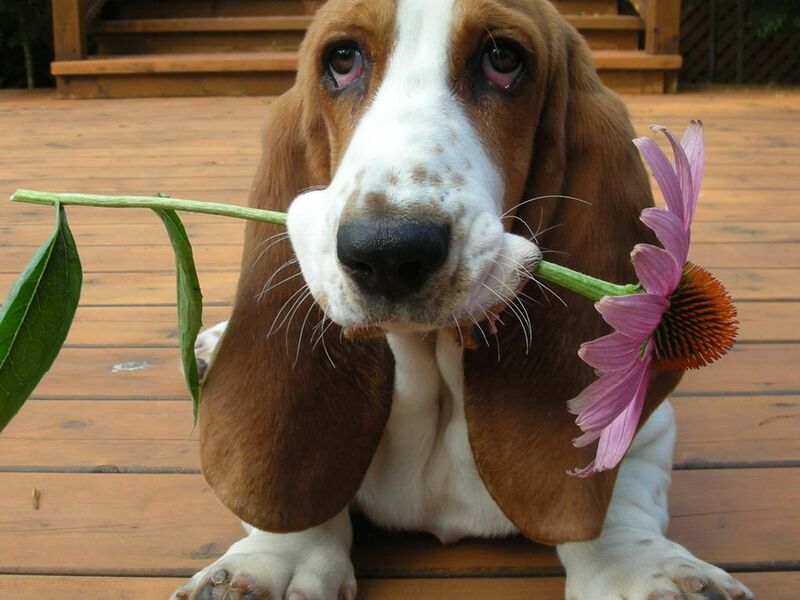 Clients are often completely baffled about their options. One of the big issues with these properties is creating usable space for my clients. A pretty landscape that can’t be used for entertaining even 4 adults is not functional in my opinion. Boulders help the designer create level, functional and usable areas. Boulders also bring nature into urban environments and add visual drama to the views from the home. A well placed boulder brings a sigh of relief to me, it’s hard to explain but I think it is the touch of nature that I feel. I loved directing the boulder placement and designing the stairs for this Willamette Heights home in NW Portland. Boulders retain the hillsides to allow the designer to carve out interesting walkways, stairs and planting areas above them. The spaces between the boulders create planting pockets which when thoughtfully planted result in layers of softening greenery. Planting the pockets creates another way to balance the proportions of hard surface to plant material. I love being able to use plants that are fussy about drainage in boulder crevices that I cannot use without copious soil preparation in flat properties. The bonus of being able to stand and tend the low maintenance plantings cannot be praised enough as my older clients will attest to. This water feature with a large drilled Montana Mud boulder has a dry return so it is safe for a front yard with no child proof fence. Boulders and water are natural partners and I love to create simple low-maintenance water features using drilled rock and echo chambers. It’s an easy way to offset traffic noise and provides water for birds, bees and possibly your dog too. With a dry return instead of a high maintenance pond there is no mud so Fido won’t get to roll in the mud and bring it in to share w your sofa or carpet. When the front yard is small we need strong visual impact to offset tall facades and large driveways. There is little plantable space and often the maximum hardscape allowed by the city or county. We need to be visually bold to offset this situation. Raising the soil with a few well placed boulders and adding complementary dramatic plant material can give us the impact we need. Japanese Maple – Acer Palmatum ‘Shindeshojo’ in Westmoreland neighborhood SE Portland Landscape Design in a Day. Here’s an example….Planting a hot colored foliage Japanese maples up in a boulder planter create excellent drainage and helps avoid the dreaded verticillium wilt which is a good example of solving multiple problems with one solution. Flat lots with heavy clay soil can severely limit the selection of plant material that will survive. Supporting the raised soil with boulders gives me a wider selection of plants that will thrive without fuss. It’s not as easy to be dramatic with a limited plant palette. Boulders work beautifully with nw natural landscape style but it is easy to use them in modern landscape design too. The caricature of modern design can be harsh, bleak and boring. Paths, patios, entries and retaining walls must be carefully shaped and proportioned. Boulders bring in the relief of nature made versus man made and create an inviting atmosphere. 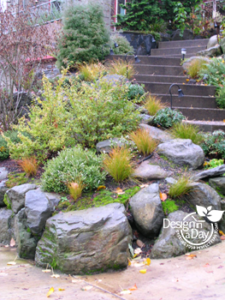 Read more about hillside landscape design. Dave and Noelle love the dyed concrete used for the lower patio entertaining area. I drove out to Cedar Mills in NW Portland to meet prospective landscape design clients Dave and Noelle. They were sitting out in their large front yard on a semi private patio. It was surrounded by large trees and was an idyllic setting. It was early evening in late summer. Dave opened a bottle of wine and we talked about their new home and goals for their landscape. They were newlyweds. 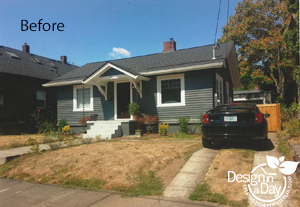 Dave and Noelle are the ultimate DIYers and fearlessly tackled many aspects of remodeling their “new to them” contemporary home. The landscape was a different story. We all must balance the demands of work and our lives with the time it can take to DIY. The clients found their sloped back yard intimidating. The backyard was a blank slate. Dave had installed an irrigation system in the past. They knew they could probably plant and do some of the landscaping work. The design however was beyond them. Their sloped property was intimidating. Finally, a place for Dave to park his truck. A weeping Japanese maple somewhere prominent for Dave. The contemporary house backs up to a natural woods and a steep canyon. The front yard was much larger than the back and although they had a great place to hang out in their front yard, they wanted to enjoy the views of nature in the back yard. It was a blank slate. As you can see from the before photos, the doors to the back yard were 2 and 1/2′ above the landscape. The landscape then sloped down to a canyon that drops off quite steeply. We didn’t have a nice big back yard with lots of depth. They wanted to be able to step out of their great room with food and easily settle into a large outdoor entertaining and dining area. Noelle wanted no steps down to the new outdoor dining area. This meant we would need to work hard for privacy from the neighbors. Rustic stone path integrates the garden rooms. I created 3 rooms at different levels. We added grade to create privacy and used our new raised outdoor dining area to provide screening for the lower dyed concrete patio and the lower still hot tub room. I created a boulder rockery that surrounds the raised dining area and created lots of planting pockets. We planted this boulder rockery to soften the effect of the large boulders. Raising the planting beds allowed us the opportunity to improve the heavy clay soil. As a Portland landscape designer I never miss a chance to improve our local clay soil. Soil preparation is such a good investment. To create privacy for the hot tub room, I placed it on the lowest level – same level as the woods and planted in front of it. This created a view of plants from the master bedroom, not the view of the hot tub. I’ve yet to have clients who think the hot tub itself is a thing of beauty. Boulders create softening with planting pockets. Materials that were used in this landscape included large boulders from Gales Creek Quarry. The patio was a dyed and textured concrete. The new dining area surface is 24″ x 24″ concrete slabs installed onto deck framing. The planter adjacent to the dining area is made of concrete board and planted with full season color plants such as heather and dwarf evergreen shrubs. Other plants we used for this design: Acer Palamatum Shaina – Japanese Maple, Vaccineum Tophat – Dwarf Blueberry, Cryptomeria Sekkan Sugi – Japanese Cedar, Pieris Japonica Little Heath – Dwarf Lilly of the Valley shrub, specialty heather varieties, many varieties of evergreen succulents and low water ornamental grasses. I was on site for grading and boulder work and worked closely with longtime contractor and excavator Joe Hurd. It was a pleasure to be able to sculpt the grade into a design that made such great use of the space. Each room was spacious and functional and flowed into the next. Here’s an example of one of Noelle’s many DIY projects. She did the stone work for her front porch. Dave and Noelle loved their new landscape. They watched the concrete contractor create their dyed concrete patio very closely. Our next project was a planting plan for the front yard and more grading and boulder work. A few years later Dave and Noelle replaced the old front yard paver patio and path with new dyed concrete all by themselves. Natch. Fearless DIYers.